U.S. shipments of residential gas storage water heaters for September 2017 increased 14.6 percent, to 377,044 units, up from 328,980 units shipped in September 2016. 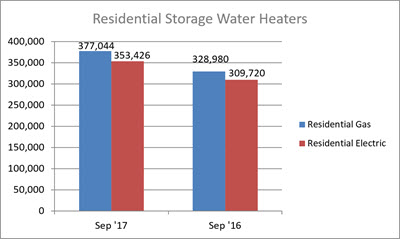 Residential electric storage water heater shipments increased 14.1 percent in September 2017, to 353,426 units, up from 309,720 units shipped in September 2016. Year-to-date U.S. shipments of residential gas storage water heaters increased 3.9 percent, to 3,298,549, compared to 3,173,840 shipped during that same period in 2016. Residential electric storage water heater shipments increased 3.9 percent year-to-date, to 3,108,192 units, compared to 2,990,140 shipped during the same period in 2016. Commercial gas storage water heater shipments decreased 6.7 percent in September 2017, to 7,731 units, down from 8,290 units shipped in September 2016. 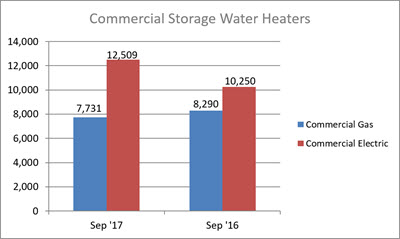 Commercial electric storage water heater shipments increased 22 percent in September 2017, to 12,509 units, up from 10,250 units shipped in September 2016. Year-to-date U.S. shipments of commercial gas storage water heaters decreased 5.7 percent, to 71,181 units, compared with 75,494 units shipped during the same period in 2016. Year-to-date commercial electric storage water heater shipments increased 14.8 percent, to 107,865 units, up from 93,931 units shipped during the same period in 2016. 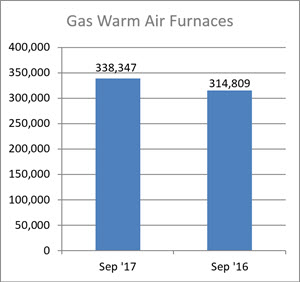 U.S. shipments of gas warm air furnaces for September 2017 increased 7.5 percent, to 338,347 units, up from 314,809 units shipped in September 2016. 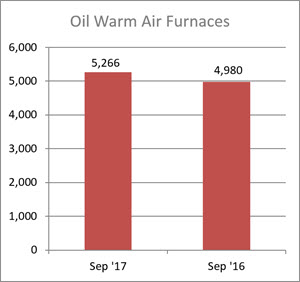 Oil warm air furnace shipments increased 5.7 percent, to 5,266 units in September 2017, up from 4,980 units shipped in September 2016. Year-to-date U.S. shipments of gas warm air furnaces increased 8 percent, to 2,276,889 units, compared with 2,107,577 units shipped during the same period in 2016. Year-to-date U.S. shipments of oil warm air furnaces increased 2 percent, to 23,422 units, compared with 22,955 units shipped during the same period in 2016. 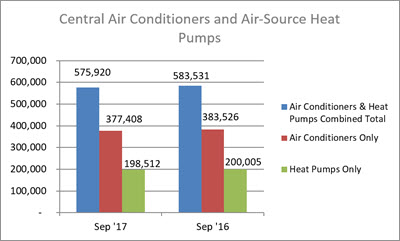 U.S. shipments of central air conditioners and air-source heat pumps totaled 575,920 units in September 2017, down 1.3 percent from 583,531 units shipped in September 2016. U.S. shipments of air conditioners decreased 1.6 percent, to 377,408 units, down from 383,526 units shipped in September 2016. U.S. shipments of air-source heat pumps decreased 0.7 percent, to 198,512 units, down from 200,005 units shipped in September 2016. Year-to-date combined shipments of central air conditioners and air-source heat pumps increased 6.5 percent, to 6,445,168, up from 6,050,465 units shipped in September 2016. Year-to-date shipments of central air conditioners increased 5.8 percent, to 4,329,473 units, up from 4,093,777 units shipped during the same period in 2016. The year-to-date total for heat pump shipments increased 8.1 percent, to 2,115,695, up from 1,956,688 units shipped during the same period in 2016.